HURLEY 6th February 2019, peacefully at his mum’s home, 43 Newbridge Park, Coleraine, Christopher (Chris), 28 Knockeden Avenue, Ballymoney. Dearly beloved son of Joe and Margaret, loving father of Scarlett and the late Ava, brother of Joseph, Sharon and Rhonda and a loving brother-in-law and uncle. Funeral Mass in Our Lady and St. Patrick’s Church, Ballymoney on Saturday at 12noon followed by interment in the adjoining churchyard. 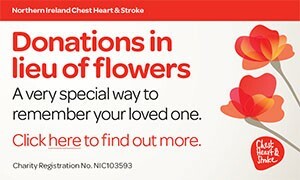 Family flowers only, donations if desired to Marie Curie Cancer Care, 1a Kensington Road, Belfast BT5 6NF. All enquiries to H Wade & Son, Funeral Directors 3 Upper Abbey Street, Coleraine. Tel: 02870343438.